What is NEM (XEM) and is it really a coin of the future? 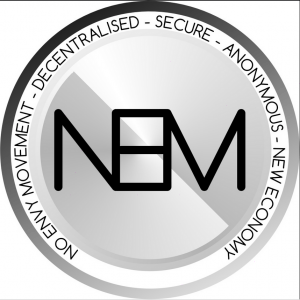 New Economy Movement (NEM) is one of the few altcoins whose concept is to address all the inherent issues affecting cryptocurrencies such as Bitcoin. Issues such as scalability, energy consumption, ease of use, incentive to use, consolidation of power by miners and governance are what NEM seeks to address. NEM cryptocurrency whose ticker symbol is XEM is an open-source blockchain altcoin which was launched in January 2014. NEM is a highly versatile crypto solution which seeks to adhere to a host of mainstream industry requirements. Essentially, NEM is designed as a financial blockchain solution and can be used for payment, clearing and settlement in a private environment which is highly controlled. This then means that NEM meets several of the regulatory requirements and guidelines in the financial industry. The crypto can be used to settle (change of ownership) any asset via the blockchain. Mijin which is a private chain of NEM has gained popularity and companies such as Hitachi have already embraced it. Many banks around the world have come to accept the importance of blockchain technology. In fact, a good number of banks in the U.S, India and Japan have already started using the technology. Because banks generally employ the smart contract concept, NEM’s platform which is asset-friendly can be used to settle any asset. In settling assets, speed, security, and reliability are very important to a mainstream institution which is what this crypto offers. NEM addresses these issues by repackaging its blockchain into a private chain and presenting it as Mijin. NEM crypto is also applicable in the technology world. Unlike Bitcoin and Dogecoin which use mining to increase the number of coins, XEM uses something called ‘harvesting’. In this process, blocks are generated and a person is rewarded for work contributed using transaction fees. Every block has a certain number of transactions which attract an unknown amount of fees. This keeps the participants incentivized to continue harvesting. For a blockchain user to be allowed to harvest, one must go through a forging mechanism process called Proof-of-Importance (POI). How is XEM doing in the exchanges? 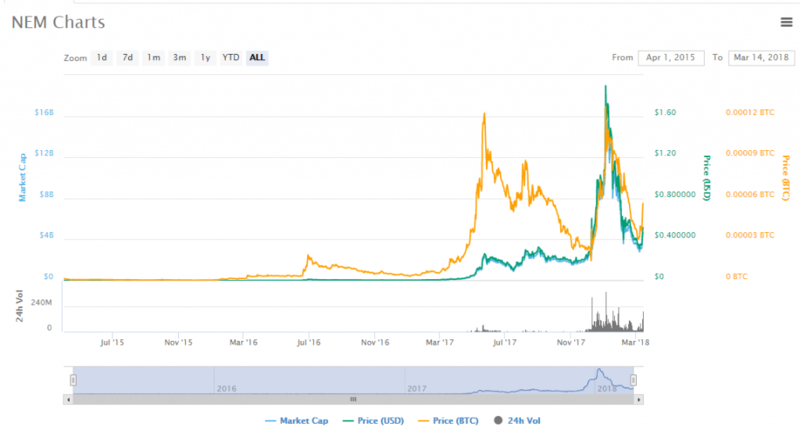 Even though the crypto was launched to help solve challenges facing digital currencies such as Bitcoin and Ethereum, the performance of NEM remained dormant for more than two years. It was only in mid-2016 that the price of the coin slightly spiked to touch $0.012. As was with new cryptocurrencies of 2017, XEM price started to rise in 2017. An all-time high price of $2 was reached on January 2nd, 2018. The market cap at the time was over $17 billion while traded volumes stood at $383 million. This made the XEM one of the highest performing altcoins in the market. The closing price of XEM on 13th March 2018 was $0.46. This is a huge drop in value given that only ten weeks before it was threatening to soar beyond the $2 ceiling. As at 14th March, the coin was number 16 in traded volumes with $163 million. The market cap at the time stood at $4.6 billion. What future does NEM (XEM) altcoin have? NEM ecosystem provides a platform for real estate, game developers, industries and start-ups. The ecosystem can also be used by innovators to create their very own blockchains for use in different areas and for specific purposes. Gaming developers have already taken the lead in utilizing the NEM ecosystem. It is only a matter of time before other players in other markets come rushing in. It is worth noting though that UtopianFuture, the co-founder of NEM stepped down after it was discovered that he had created sockpuppet accounts. In his defense, he claimed that he created the accounts in the hope of increasing demand at a time when NEM had few supporters.